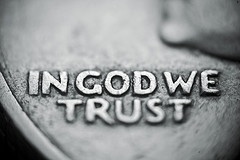 The phrase, “In God We Trust”, is found on the United States’ currency. I fear it will not be there for very much longer. Why? As a nation, the majority seems to have lost their trust in God. The polls suggest a majority of Americans still believe in God, but how can anyone have faith in someone or something they no longer trust. We know the biblical definition of faith found in Hebrews 11:1 – “Now faith is the assurance of things hoped for, the conviction of things not seen”(NASB). Thus, we have the difference in belief and faith; trust! Do we really trust God? When we receive a promise and feel assured the promise will be delivered, we must necessarily trust the promise giver. In Joshua 1, God spoke to Joshua encouraging him to be strong and courageous in the face of the daunting task of taking the promised land. In His encouragement, He promised Joshua something that would bolster his courage; in verse 5 He tells him – “I will be with you; I will not fail you or forsake you.” What it came down to; did Joshua merely believe in God or did he believe God. Did he trust God when He said to enter the land which He was giving the people; the land of promise? The question we all have to ask ourselves is, do we just acknowledge God or do we really believe Him and trust Him? When we read about the examples of faith listed in Hebrews 11, we read about people who really trusted God. God had made each of them promises. Each acted boldly based on their trust that God would keep His promises. Verse 13 tells us they trusted in God and His promises though they died without seeing the promises fulfilled. God has made us promises. Do we trust Him so as to act boldly based on those promises even if we do not see them fulfilled in this physical life? This is a time in my life when I see the world not knowing who to trust anymore. Marriages fail due to a violation of the trust spouses place in each other. We see our current financial crisis because individuals with great power have violated the trust placed in them. Many see our government in what appears to be a complete shambles, so they have lost their trust in its ability to govern effectively anymore. When all else fails and when our trusted companions let us down, we can still trust in our God. We may not see the results we long for while on this earth, but do not construe this to mean that the results will not come. I often ask myself, do I want what I want now because I have placed too much emphasis on the here and now, or do I trust God to keep His most precious promise in the judgment? I strive to have a faith like Paul’s when he said in 2 Timothy 1:12 – “… for I know whom I have believed and I am convinced that He is able to guard what I have entrusted to Him until that day” (NASB). I take great comfort in the words of Jesus when He spoke to Thomas about you and me in John 20:29 – “…Because you have seen Me, have you believed? Blessed are they who did not see, and yet believed”(NASB). As a part of that faith, we must truly trust in God and Jesus to fulfill the promises made to us all. True faith and trust comes from knowledge of God and the history of His promise keeping. This knowledge is not found in philosophy or secular education; it is found in the Bible according to Romans 10:17. God has revealed Himself to us through His Word. But even beyond that, He has revealed Himself to us through His creation. Romans 1:18-22 tells us that God’s creation reveals His power, and by its very existence, man knows God. Verse 20 says, “For since the creation of the world His invisible attributes, His eternal power and divine nature, have been clearly seen, being understood through what has been made, so that they are without excuse.” Verse 21 tells us that some did not acknowledge God because of their futile speculations and their hearts became darkened. Verse 22 says “Professing to be wise, they became fools.” I am reminded of the Russian cosmonaut, Yuri Gagarin, who while in space said he did not see God up there. Yet, astronauts Borman, Lovell and Anders of Apollo 8, chose to read from Genesis 1 about God’s creation. As Romans 1 tells us, some may come to distrust God to the point they no longer acknowledge God. Their hearts have become darkened. Let’s all be guided by the wisdom found in Proverbs 3:5-8 – “Trust in the Lord with all your heart, And do not lean on your own understanding. In all your ways acknowledge Him, And He will make your paths straight. Do not be wise in your own eyes; Fear the Lord and turn away from evil. It will be healing to your body, And refreshment to your bones.” Do I possess all knowledge and all understanding? No! But I do know God and am determined to obey His will whether I understand it completely or not. It’s a matter of trust. In God we must trust!